A six year old girl heard her mother say that some children don’t get presents for Christmas – even if they are on the ‘good list’. The comment was made in passing so mom didn’t think of six year old Emmileah responding. She put her to bed and checked on the little girl a while later. 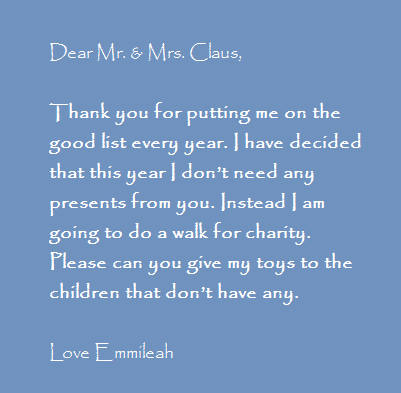 That’s when Emmileah asked her mom if she could post a letter for her. Thank you for putting me on the good list every year. I have decided that this year I don’t need any presents from you. Instead I am going to do a walk for charity. Please can you give my toys to the children that don’t have any. Mom said she read the letter and cried for fifteen minutes. The little girl said, “I felt bad that other children didn’t have toys. I didn’t know that before,” Emmileah of England said. ”It’s not because I don’t want any presents. I just don’t really need them.” I learned about this story here at Care2.